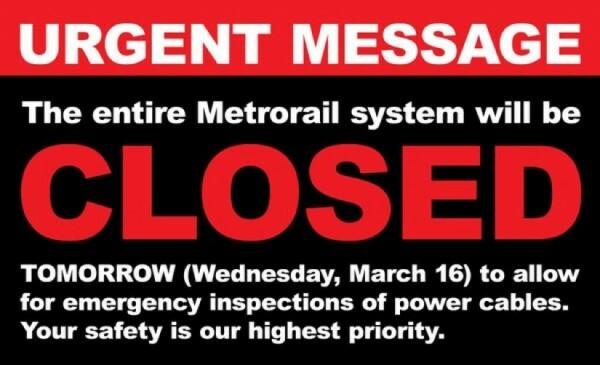 Welcome to Wednesday, where Washington is without a Metro system. Metro General Manager/CEO Paul J. Wiedefeld says that 600 third-rail power cables must undergo an emergency safety inspection, and in order to do that the rail system will be closed from 12 a.m. Wednesday to 5 a.m. Thursday. The federal government has offered unscheduled leave or telework to its employees. But that still leaves thousands of people who need to get to downtown DC or get around the DC area without rail. The Virginia Department of Transportation (VDOT) advises drivers to be prepared for increased congestion on major travel routes, and asks commuters to strongly consider alternate plans to driving. High occupancy vehicle (HOV) rush-hour restrictions will remain in place on I-66 and I-395 to encourage and accommodate additional ridesharing, says VDOT. VDOT’s Traffic Operations Center will actively monitor conditions through the day and adjust signal timing where possible to help traffic flow. Crews will limit lane closures on interstates and major commuter routes through the day. Check current I-95/395 corridor travel times for bus, VRE and HOV at VDOT’s 511 northern Virginia commuter page: www.511virginia.org/nova. Fairfax Connector is offering regular service today, as well as emergency shuttle service to the Pentagon. See details on Fairfaxcounty.gov. Capital Bikshare could help you downtown. Learn more about Uber, Lyft and other downtown alternatives in this Washington Business Journal article. Keep up with conditions downtown on this live blog from The Washington Post. Are you heading downtown today? What’s your plan?